The genkan APP extends the user experience to both Apple™ and Android devices and offers functionality for all users of genkan, Administrators, Housekeeping and Owners alike. Property owners who have their property managed by genkan have the ability through the APP to book their property on their smart phone or tablet. Owners can make bookings, check forward bookings, current bookings and view the amounts of these bookings. Property Managers / Administrators have similar functionality but can view the business as one and can view current results against the past. 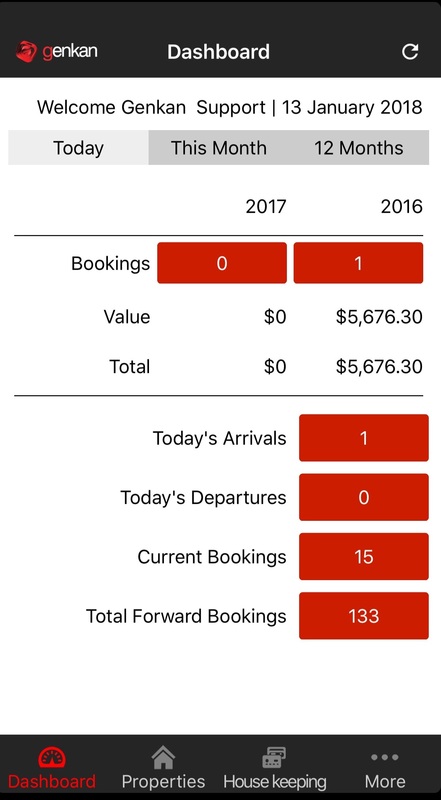 Arrivals and departure reports are a feature of the functionality. Housekeepers have arrival and departure information in their at all times. The genkan APP is an ongoing development and during 2015 will extend to a customer/ client APP.